"A delicious fried egg dish." Heat vegetable oil in a non-stick frying pan over low heat. Pour hot water into a bowl. Break matzoh sheets into small chunks and soak in hot water, about 2 minutes. Whisk eggs and 1/8 teaspoon kosher salt in a separate bowl. Strain matzoh and shake to remove excess water; stir matzoh into egg mixture. Pour the heated oil out of non-stick frying pan; place 1/2 tablespoon butter in hot pan. Pour matzoh and egg mixture into hot butter; cover and cook until a 'pancake' forms, about 10 minutes. Slide matzoh 'pancake' onto a plate. Place remaining 1/2 tablespoon butter in hot pan. Place a second plate over matzoh 'pancake' and flip plates over so the uncooked side is on the bottom. Lie matzoh 'pancake' in melted butter; cover pan and cook until bottom of pancake is browned, about 8 minutes. Remove from heat and season with kosher salt. 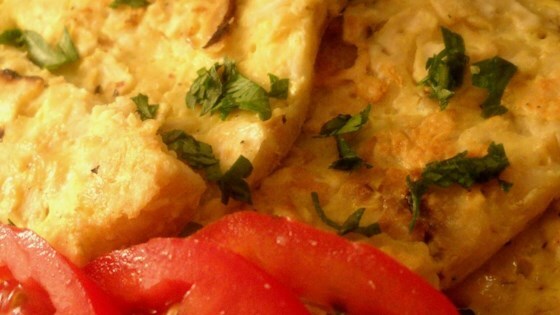 The cheesy-crisp alternative to hash browns! I only had onion matzoh. Added a pinch of onion powder to the egg mixture. Served them sprinkled with a little ground black pepper and sour cream. Yummy.